If Modernism were a religion, Berthold Lubetkin would be one of its patron saints. Born in Georgia in 1901, he studied first in post-Revolution Russia, then Warsaw and Berlin before moving on to Paris. Here he set up his first architectural practice, working under the influence of Le Corbusier, and designed a few uncompromising apartment blocks. In 1931 he moved to London and, along with a small group of design graduates, formed the Tecton architectural cooperative. His subsequent work got him noticed, then acclaimed, before a highly promising career trajectory was stalled by World War Two. Tecton was disbanded in 1950, after which Lubetkin switched track entirely and took over a remote Gloucestershire farm, where he lived in relative exile with his family until his death in 1990. Sorry that was a bit whistlestop, but there's more to read here, here and see here. Three of his most well known buildings were Open at the weekend, so I made my pilgrimage. Lubetkin's first London foray was a circular drum for London Zoo's largest apes - half enclosed and half open - now occupied by lemurs. Elliptical and swooshy, and a masterpiece in every way except that the penguins didn't much like it so are now housed in a former duckpond. 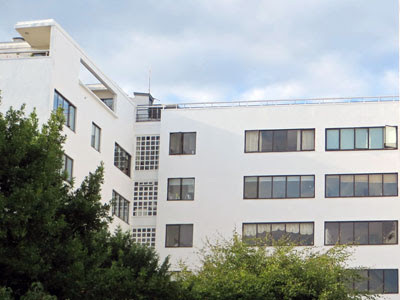 Lutbetkin's second major client was the office equipment magnate Sigmund Gestetner. He wanted modern housing for his workers, originally in Camden, but was drinking in Highgate one day when he spotted a house for sale on North Hill opposite the pub. Convinced that the ridgetop provided a much better location, the site was bought and plans drawn up for a block of commercial apartments. Restricted by a narrow plot and various height regulations, a double cruciform design was settled on and a groundbreaking development took shape. The front's alas shrouded in scaffolding at present, so don't expect much in the way of photos. Open House tours of Highpoint vanish fast, and rightly so. For your booking you get not just a tour inside the buildings but the opportunity to look round two actual flats and a peer down the garden. You also get a damned good factsheet rammed with facts and floorplans, and a bonus leaflet written by a ten year-old resident which puts other venues' brief Gestetnered pages to shame. You get a fabulous tour guide, who might be a renowned architectural expert, might be the owner of one of the flats or might be that very same ten-year-old girl - because living in this building clearly breeds self confidence. And you get a better class of fellow tour member, with one of my companions casually dropping in the fact that he'd known Lubetkin's daughter, and met the great man, and knew a stash of juicy gossip too. What a fantastic building Highpoint One is, inasmuch as any 1930s construction can ever be fully adapted for modern living. Its sleek white exterior we had to take as read, but even the entrance passage was something special. This curves in low via a Winter Garden, essentially a lobby with a few cacti, then steps up to a perfectly balanced hall with lift shafts at either end. Residents (who these days tend to be on the wealthier side) wander through with shopping, or out to socialise, perhaps via the asymmetric staircases curling round the each shaft. Glass bricks help illuminate each landing, these once communal space, now sealed off to provide a smidgeon more space in the flats behind. These are of two types, one stretching to a dining room and extra bedroom, and each with the internal beams tucked cunningly away to maximise available space. If you have shelves of architectural hardbacks and an Isokon Penguin Donkey you'll fit right in. Community was hugely important to Lubetkin so he built a light and airy Tea Room for residents in the basement, the slope of the land meaning this was also the exit to the gardens. These are extensive, and accessed down an elliptical ramp that's instantly reminiscent of Tecton's penguin project. The gardens focus more on lawn than flowerbed, stepping down from a mown terrace and converted bomb shelter to two decently-used tennis courts and an open-air swimming pool... all strictly no photos, so you'll have to imagine. Herr Gestetner was soon persuaded to buy the plot nextdoor and so a second meisterwerk arose. 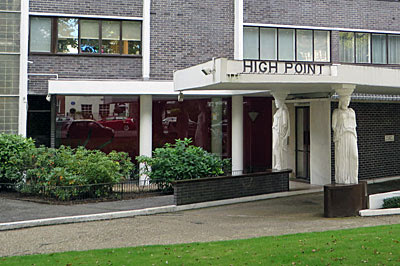 But whereas Highpoint One had been built with middle class egalitarianism in mind, Highpoint Two was unashamedly targeted at the luxurious end of the market. Only twelve flats were planned, as opposed to 65 nextdoor, each with a double bathroom (unheard of!) and encompassing more than one floor. This time the building flanked the main road, accessed via a short drive with a Hollywood-style drop-off where your chauffeur could temporarily pause. The entrance is particularly showy, not least the caryatids who look like they're holding up the porch, plus a much more impressive display of cacti than nextdoor. Servants had their own staircase leading to each flat's kitchen and pantry, whereas residents enjoyed the height of luxury - an exclusive lift. This doubled as the front door, opening on one side of the shaft or the other (with a ding) depending on which of the two apartments had called it. We got to visit a top level maisonette, this one owned by the lady leading the tour, to whom enormous thanks both for allowing us to snoop and for the expert commentary all the way round. We were told that moving in had been a challenge, given that the previous bedridden resident hadn't been able to keep up with maintenance, and even today one of the bathrooms has the original fixtures but no water on tap. We could also see how much time and effort had gone into refurbishing the apartment, a lengthy project completed as recently as 2012. What we weren't expecting was to step out of the hallway into the main duplex living room and, wow. On Open House weekend a guide with a key can lead you through locked doors to either side to view two airy corridors, off which a string of clinics are still located. They can't take you onto the balcony above the entrance because that's unsafe for large groups, but there is access to what was planned as a 70-seater lecture theatre and is now back offices. It's also possible to head down to the boiler room, because public buildings are about more than front of house, and to visit the service yard out the back where years of NHS cutbacks are laid bare. 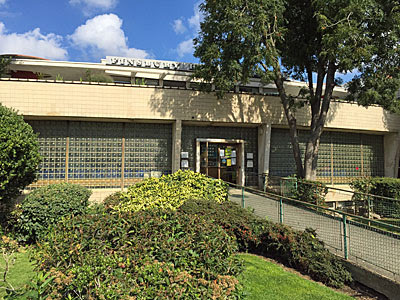 Several of Lubetkin's glass bricks are cracked, others missing, and it's not known if sufficient budget will ever be found to rectify the damage. Which'd be a damned shame, because it's generally accepted that this backstreet pioneer was a model for the advent of the National Health Service ten years later. Thanks Berthold, thanks for everything! Top class social housing estate opposite Sadlers Wells, but no tours this year.